The Hanged Man is a major arcana card that appears in the Rider-Waite-Smith tarot and other decks based on the Latin Tarot or Tarot de Marseilles. How you interpret this card in a tarot spread depends on the card's symbolism, where it appears in the spread, and whether it is upright or reversed. 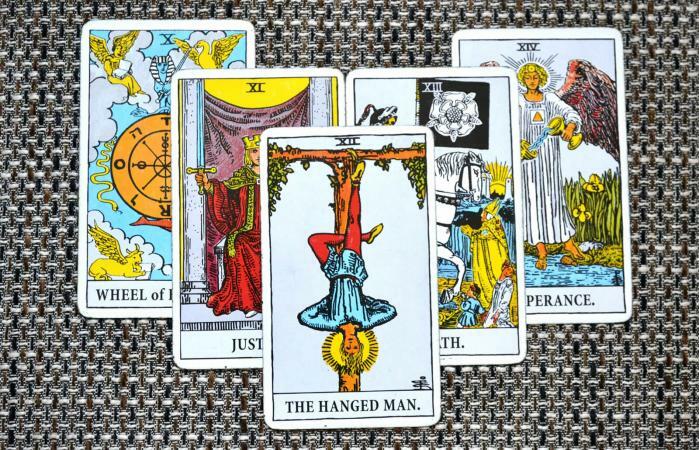 On the major arcana card the Hanged Man, there is a young man hanging upside down from a T-shaped tree. He is tied to the tree by one leg with his arms bent at the elbows and hands on his hips. His face is calm, and a golden halo surrounds his head. Major arcana cards in the tarot represent archetypal energies. They show the progression of the soul from innocence (The Fool) and complete lack of knowledge or awareness, through spiritual awakening, and ultimately to enlightenment (The World). The Hanged Man comes at the end of the series of cards showing spiritual growth and progression, including The Hermit (spiritual knowledge and teaching), Wheel of Fortune (creation), and Justice (living in truth and integrity). He appears immediately before a series of cards that seemingly depict catastrophe (Death, the Devil, the Tower) but which actually show how true change and growth occurs on a spiritual level. The Hanged Man is at the start of this sequence. The Hanged Man is the 13th card of the major arcana, but he is numbered XII (12) because the major arcana starts with 0, The Fool. In numerology, the number 12 signifies completion (12 months of the year, 12 disciples of Jesus), and it is also reduced to the number 3 (1+2=3), which is a number of spirituality and creativity. The tree is shaped as a T, which represents the cross, a Christian symbol of Christ, the crucifixion, and ultimate salvation. The tree also represents the tree of life which grew alongside the tree of knowledge of good and evil in the Garden of Eden (Genesis 2:9). The tree of life contains fruit that offers eternal life. There are buds on the tree, suggesting the possibility for future blossoming. The young man echoes the theme of the cross in his positioning. One leg is tied, and the other is bent at the knee with the opposite foot resting behind his knee and he hangs, arms akimbo. Arthur Edward Waite, creator of the Waite tarot deck, noted this positioning represented a combination of the Tau cross, which was an ancient Christian symbol favored by St. Francis of Assisi, and the fylfot cross, which symbolized many things in different religions, including Hinduism and Christianity, before its reversed image was co-opted by the Nazis and the Hitler regime. The hanging upside down is a relatively simple symbol. The young man finds himself in a difficult situation, hanging upside down by his ankle. He is "hanging around" waiting for something. Perhaps the most important symbols on this card are the young man's expressions and halo. They suggest that in spite of his difficult circumstances, he is waiting peacefully and calmly, and the halo serves as a symbol of enlightenment, showing the young man is turning to spiritual principles to remain peaceful in difficult circumstances as he awaits his fate. Together, the symbols give clues as to the meaning of the Hanged Man in a spread. When he appears he suggests that things in life may not be moving quickly and may feel like they aren't quite to your liking, but the way through is to wait peacefully and patiently with care given that you remain in your own sense of integrity and proper spiritual principles. The hanged man is the ultimate sign to wait it out in peace. Reversed, the hanged man may suggest you are holding tightly to something you need to let go of. It may also suggest you are stuck in a pattern of thinking and believing that no longer serves you. The Hanged Man offers a path through obstacles or slow downs when you feel you are stuck and just hanging around. It suggests you wait patiently and focus on your core spiritual principles as you wait to make forward progress.